5 "Shared vs. Reseller Hosting" Differences — Which is Better? 5 "Shared vs. Reseller Hosting" Differences: Which is Better? As the resident techie in my family and friend group, I have often been recruited to “help” folks choose a domain, sign up with a web host, get WordPress up and running, and explain little things like, “Why is my blog post showing up on the homepage?” And every time, I start with, “Give me your login info, and let me see what’s going on…” Sometimes it’s a quick fix. Other times, my weekend is spent weeding through plugin updates or fumbling with clunky templates. In either case, I’m happy. I love this stuff. But I’ve acquired a mess of login credentials along the way, and I’m not directly connected to, nor responsible for, any of their hosting resources, so my control over how I can “help” is limited. In hindsight, I could have easily formalized this system into a side business. Rather than signing my friends and clients up for shared hosting accounts billed by a plethora of providers, I could have become a hosting reseller and managed each of their accounts myself. More money for me, less headache for them — err’ybody wins! Deciding between shared or reseller hosting can get confusing, though, so let’s go over the key differences real quick (in 1,500 words or less). Shared and reseller hosting are an easily confused pair. They both entail (for the most part) a singular server being shared by multiple customers. Reseller hosting, as its name suggests, simply adds another layer of ownership in between the website owner(s) and the original server host. The added administrative and server control this gives that middle man or woman is what dictates whether shared or reseller hosting is most useful to you. Shared hosting is ideal for individuals and business owners who simply need a means of getting their website online. Your host is in control of what resources are allocated to you, and you focus on your site design, email setup, and domain management. Reseller hosting is great for freelance developers who want to host multiple client sites, serial startup owners who anticipate launching various projects, and/or technical entrepreneurs who want to take on web hosting as their next business venture. Once you purchase a select amount of bandwidth and server resources from a host, you can reallocate those resources to other clients or websites as you see fit. You get greater control over server settings and domains, and you get the added benefits of billing tools since you’re essentially running your own hosting business by reselling your host’s services. Both shared and reseller hosting customers are typically given some sort of management panel. Typically, end users get cPanel (shared hosting), and resellers get WHM (reseller hosting). Most reputable web hosting providers will include a cPanel license in shared hosting plans. A web hosting control panel, like cPanel, gives users access to management options for domains, email, FTP, SSH users/keys, databases, and backups, as well as some sort of application that lets you download and install other software such as WordPress or Magento. The majority of hosts will offer a free cPanel license with shared hosting accounts, and this is more than enough to satisfy the typical shared hosting customer. Other popular control panels include Plesk, Webmin, and ISPmanager. 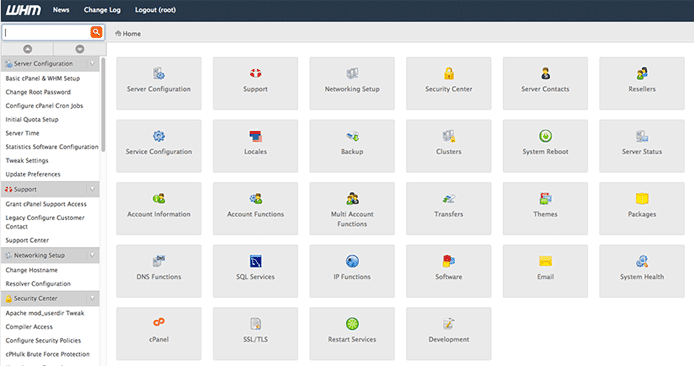 Reseller hosting customers can use cPanel & WHM to manage multiple accounts from one console. 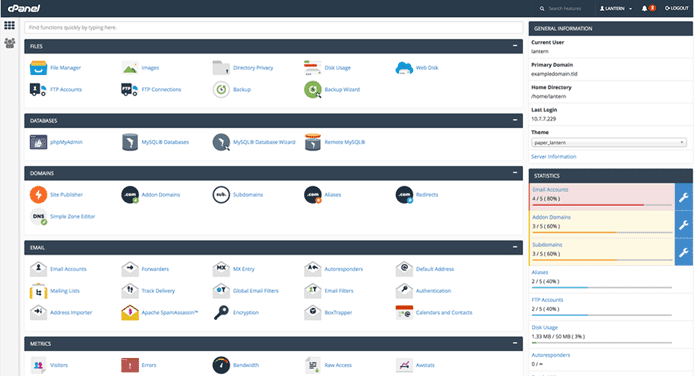 Reseller hosting users get an upgraded flavor of cPanel: cPanel & WHM. The latter part of the name is short for Web Host Manager, and it functions as the billing and hosting account management portal for your hosting business. You can create, change, and manage reseller accounts and admin permissions; set up server alerts; assign custom features to or upgrade or downgrade specific hosting accounts; park domain names; generate and install SSL certificates; and limit bandwidth usage by your clients, among other capabilities. For the most part, shared hosting users can host one website on a basic plan. Some hosts, such as InMotion, will allow you to host unlimited websites on a single account. Others will allow it, but at a premium rate, and some limit one website per account. In case it wasn’t obvious, reseller hosting users can host more than one site. For the most part, you can reallocate resources however you see fit, so long as you don’t cause issues for your host such as I/O or CPU bottlenecking. Resellers get the added perks of personal nameservers, which streamline the management intricacies of hosting multiple websites. A nameserver is a computer that translates domain names into IP addresses and vice versa. Without nameservers, you’d have to type in a 10-digit code to reach your favorite website. Domain names are much more memorable, and nameservers allow us to use them to navigate the web. Personal nameservers give you greater control over your domain and your clients’ domain names, which can become associated with your main domain, simplifying management a whole bunch. Shared hosting comes with a central risk and reward. You’re sharing server resources, including bandwidth, storage, RAM — and the responsibility of all of your server neighbors’ sites. If one of their sites becomes compromised, your site is susceptible to the same fate. That being said, shared hosting means there is a finite number of resources available to be dispersed between customers. Although shared hosts often promise unlimited or unmetered resources, that’s not technically true. Those hosts know, however, that most shared server customers won’t come anywhere near those limits, so it’s a nice marketing ploy. When you do start to outgrow the shared hosting environment, the best hosts are great about welcoming you into the worlds of VPS and dedicated hosting options. Although shared hosting provides more than enough performance for the average site owner, and it is inherently safe, folks looking to host multiple websites would probably do better with a reseller hosting plan. It should come as no surprise that the added server resources, control, and business opportunities that come with reseller hosting bump the price up a notch or two from the shared hosting ballpark. Shared hosting typically costs users $2 to $10 per month; whereas reseller hosting may start at the $10 to $20 monthly rate. That monthly cost does not factor in your monthly profits as a reseller of hosting services. Now that we’ve declared the similarities and differences of these two hosting types, let’s compare hosts. Next up: The best of the best providers and plans in shared and reseller web hosting. As we move along to the top reseller hosting providers, you may notice some familiar faces. We’ve found the best hosts overall boast a myriad of services, included shared, reseller, managed, and application-specific hosting. Is Shared or Reseller Web Hosting the Better Call for Your Project? As is the case when purchasing any other hosting type, the decision to sign up for shared or reseller hosting entirely depends on how you intend to use it and how much control you require. If it’s just you, your website, and your business, shared hosting will more than suffice. If you’re planning on running multiple sites, or if you have the fate of multiple businesses in your hands as a freelancer, reseller hosting is a worthwhile route to explore. Whichever path you choose, I hope it’s laden with growth and revenue opportunities — because no one takes the time to build an online business to be paid in hugs and happy thoughts, right?